The Federal Reserve’s decision to raise interest rates will boost revenue throughout the bank industry, especially at Bank of America. A flag outside the Federal Reserve Bank of New York. Image source: iStock/Thinkstock. 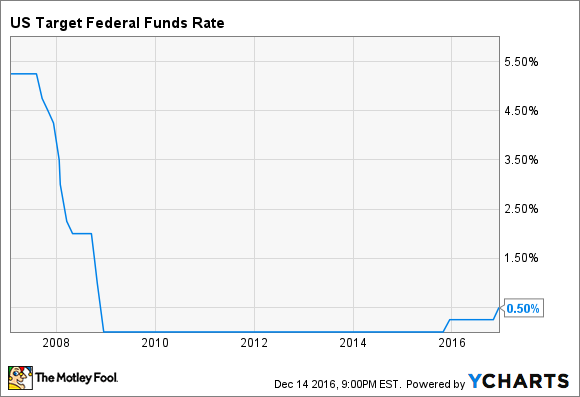 After analysts and commentators had predicted an interest-rate hike for most of 2016, the Federal Reserve finally came through for them. The central bank concluded its latest monetary policy committee meeting on Wednesday by releasing a statement saying that it had decided to boost the Fed Funds rate by 25 basis points, or 0.25 percentage points. This is great news for banks, which stand to make a lot more money when rates rise, and none more so than Bank of America (NYSE:BAC). "In view of realized and expected labor market conditions and inflation, the Committee decided to raise the target range for the federal funds rate to 1/2 to 3/4 percent," says the Fed's press release. "In determining the timing and size of future adjustments to the target range for the federal funds rate, the Committee will assess realized and expected economic conditions relative to its objectives of maximum employment and 2 percent inflation." The move didn't come as a shock. Going into Wednesday, an analysis of Fed Fund futures prices, which gauge the market's view on changes in monetary policy, tagged the likelihood of an increase at 95%. Much of the optimism was tied to the fact that the unemployment figures for November were surprisingly good. The unemployment rate last month dropped to 4.6%, down from 4.9% in October. 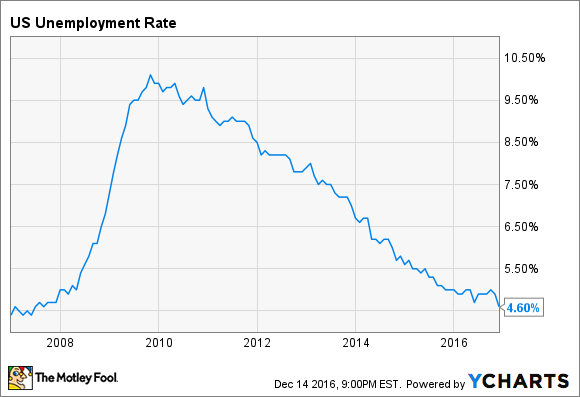 That's well below the Fed's 5% target and it's the lowest the unemployment rate has been since August 2007. Another sign that the Fed's decision wasn't a surprise can be surmised from the fact that bank stocks barely budged today. Shares of JPMorgan Chase were essentially flat, Bank of America closed 0.27% higher, and Citigroup was down by 0.57%. The one exception among the nation's biggest banks was Wells Fargo, which saw its share price drop by 2%. But that had less to do with interest rates, and more to do with the Fed's announcement after the market closed on Tuesday that Wells Fargo had failed to remedy defects in its so-called living will that regulators had identified back in April -- click here to read more about this. For investors in bank stocks who have waited patiently for rates to rise, this is unquestionably a positive development. One way to think about banks is that, by making loans, they effectively sell money. And interest rates are the price at which they do so. As rates rise, in turn, so too will bank profits. All banks will benefit from this trend, but Bank of America is positioned to benefit the most. According to its latest quarterly regulatory filing, its 10-Q, Bank of America's net interest income will increase by $5.3 billion over the next 12 months if short- and long-term rates rise by 100 basis points, or 1 percentage point. Bank of America obviously won't see the entirety of that $5.3 billion in added net interest income just yet, given that the Fed boosted short-term rates by only a quarter of that amount. But the North Carolina-based bank will benefit from a portion of the increase. And even more importantly, the Fed's decision to hike rates is a clear signal that the economy is heading in the right direction.